We’re all for fitting in more terpenes wherever we can, so when the CBDfx CBD terpenes oil was unveiled we jumped at the chance to try it. This is the first time this highly respected brand has released a terpenes-specific product. Let’s jump in and see how it fared in our review. CBDfx CBD terpenes oil is essentially a full spectrum CBD oil, infused with valuable terpenes that provide aroma as well as their own therapeutic effects. As with all CBDfx products, it is 3rd party tested and made from organic hemp plants using their own CO2 extraction process. The only bottle size is 30ml, but it does come in two different strengths: 250mg, or 500mg of CBD. As of this writing, CBDfx offers four different flavors: Pineapple Express, Gelato, Platinum Rose, and OG Kush. 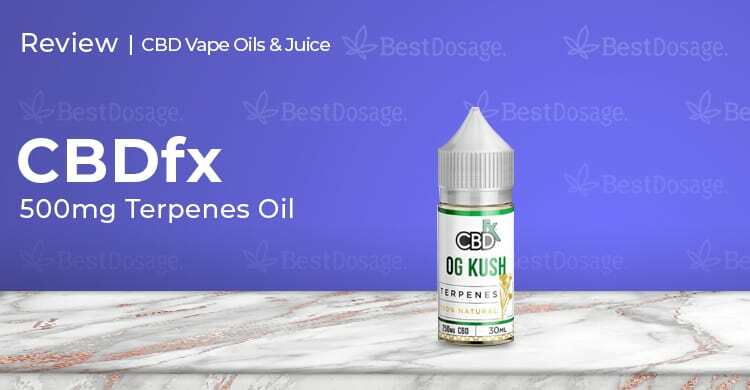 CBDfx CBD terpenes oil is perfect for vaping but can be ingested orally as well. Some more sleek looking packaging here by CBDfx, and boy do we love that! Good looking packaging shows us how much a company pays attention to the little things. Here we were able to try all of their four current flavors, and we liked that each one came in its own font color. It made them easy to distinguish from each other from afar. The bottle is pretty small, which makes it easy to take on the go for refills, but it’s made of a thick plastic so we weren’t worried about spills. Cracking open the bottle for the first time, we immediately understood the terpenes difference. The aroma was unmistakable for each flavor, but not overwhelming. It simply draws you in and makes you insist on tasting. Who are we to deny ourselves? CBDfx CBD terpene oil vaped really well but tasted even better. We were split on which flavor is the best, but Gelato probably received the most overall acclaim. One person on our team stopped smoking THC long ago but indulged in the OG Kush flavor that brought so many memories rushing back. To say these flavors are fun is an understatement. We sure do love vaping CBD, and that’s partly because it works super fast. The effect happened within minutes for some us, while we still had hints of those awesome flavors in our mouth, and no longer than 20 minutes for anyone. Those of us using CBD for anxiety felt an immediate effect, but it did a good job with all the ailments we were targeting really. It took a couple extra puffs to work for acute pain caused by a foot injury for one person on our team, but it definitely worked. Overall the effect was very similar to what you get from CBD vape oil, but it seemed to have a little more kick to it. Free shipping on all orders in the USA – can’t beat that! CBDfx also offers a great tracking system for those who like to track their packages. Which is basically everyone, right? We definitely came away with very positive feelings about the new CBDfx CBD terpenes oil. According to their site, CBDfx CBD terpenes oil is supposed to be packed with antioxidants. In the end, this is really another bottle of high-quality CBD vape oil, with the extra enhancement of terpenes. It does come out a little more expensive than other CBD vape oils, but you can’t argue with the quality. This would be a great option to add to your CBD vape oil or vape juice cabinet.